Works from the Kabul Museum at Lost and Stolen Images: Afghanistan, The Huntington Photographic Archive of Buddhist and Related Art, Ohio State University. For thousands of years, Afghanistan was a crossroad for trade from India, Iran, and Central Asia. As a result, many treasures and artifacts have been discovered and collected. The Kabul Museum, housed the most comprehensive record of Central Asian history. Many of its pieces have been dated as far back as pre-historic times. One of the museum's largest displays, was the magnificent Bagram Collection. Discovered in 1939, by archaeologists excavating a Kushan fort, it contained an amazing 1,800 pieces from India, Rome, Greece, Egypt, and Central Asia. The Kabul Museum also had one of the largest displays of Greek and Roman coins found near Kabul. This collection was a historical treasure, as it contained coins from numerous civilizations dating from the 8th century B.C. to the late 19th century. These treasures and many others were tragically lost when the Kabul Museum was bombed in 1993. At first, only the upper galleries suffered losses and looting. The remaining artifacts, were transferred to lower leveled, steel doored vaults. In 1994, the United Nations attempted to stop the looting by repairing the doors, and bricking up the windows. Disappointingly, these attempts failed, and looters continued to plunder 90% of the museum's collections. Both private collectors and antique dealers from as far away as Tokyo, have purchased stolen museum pieces. Looted artifacts have shown up all over the world, and they bring in large sums of money to the criminals. In early March 2001, the Taliban decided to destroy all pre-Islamic statues and objects in Afghanistan, after an edict was announced by their leader Mullah Omar in late February. The Taliban destroyed numerous statues in the museum which survived the previous looting and destruction as a result of war. The Taliban also destroyed the two giant Buddhas from the 5th century in Bamiyan, and other ancient historical statues in Ghazni. One of the Buddhas in Bamiyan was the world's tallest standing Buddha. At one time, Buddhism flourished in Afghanistan and this sculpture is proof of this. 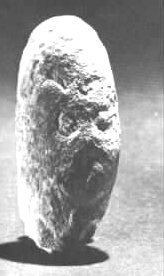 This image of Buddha's head is from Shotorak and it stands 22 cm tall. The mass like quality is typical of many of the late Gandhara Buddha images. This slate Buddha statue from Shotorak is 83.5 cm tall. This scene depicts Megha throwing five lotus flowers to Buddha. This carving represents the legend of the last Buddha of the past, who predicts the coming of the last Buddha Gautama. This bull's head is made out of baked clay, and stands 4.9 cm tall. This is very similar to many animal like statues found in Baluchistan. This lion figurine is made out of ivory, and it is 4.5 cm tall. 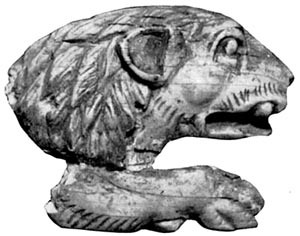 This lion probably was one of the feet on a small stool. This beautiful bronze bracelet was found in Northern Afghanistan, Badakshan. It has a diameter of 12 cm and finished with animal heads on each side. 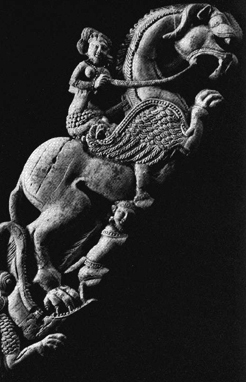 This marble lion figure from Ghazni is carved on both sides, and stands 37 cm in height. This art is typical of other figurines found in other early Islamic civilizations. These figurines are made out of baked clay. The one on the left is 6 cm tall and the one on the right is 5.5 cm. These figurines supposedly represent the great pagan mother goddess, and many similar ones have been found in Southern Afghanistan (Baluchistan). This ivory carving was carved on both sides, probably to support the arm of a throne. Its dimensions are 25.4 x 17 cm. This is very typical of Indian stone figurines. This ivory depiction of a river goddess was found in Begram, and stands 47 cm tall. This is a statue of a Naga King emerging from a tank, and it appears to be holding the stalk of a lotus. The statue is 40 cm tall and made out of clay. This coin found in Kabul, shows the head of the goddess Athena. These coins were imported by Greek colonies who were transplanted to Afghanistan by Persian rulers before Alexander the Great conquered the area. This painted clay mask stands 19 cm tall and represents the face of a demon. The style is similar to stucco decorations of a cave in Bamiyan. May be dated 7th Century AD. This clay dish from Bamiyan is 38 cm in diameter. It depicts 2 birds holding a string of pearls. This medallion from Tapa Kalan is 11 cm tall. The medallion features a young man holding an alms bowl and a staff. This is similar to other medallions found in Begram. This lime stone figure represents the city of the goddess of Hadda. The emblem that the goddess holds, is thought to suggest that the worship of her during the time of the Kushans is connected with the worship of a Persian goddess of fortune. This figure from Shotorak is 50 cm tall. The figure is wearing a typical Kushan mantle. This type of dress is often seen in the statue of King Kanishka. This ivory piece dates back to the 2nd Century, where it was used as a jeweled casket. Note the intricate designs and images on it. The following are made out of painted glass. They are 13.5 cm in height, and typical of all the glassware found in Begram. The main figure is the god Isis, and this glassware was probably imported from Alexandria. This figure of Maitreya and worshippers from Paitava, stands 25 cm tall. This piece is from the 3rd Century and represents an orientalized Roman sculpture. This ivory panel from Begram is 8 X 13.5 cm, and it is an incised drawing rather than a carving. This type of placuette is typical of those designed for royal thrones. This stucco piece from Tapa Kalan is 21.5 cm tall, and it represents the head of a noble man. This stucco figure from Tapa-I-Kafariha, is wearing a pushtin. The statue is 13.8 cm tall, and is probably representative of an attendant in the army of Mara. This white marble statue of Surya in his chariot stands 32 cm tall. This image is housed in a sanctuary that is dedicated to the worship of the sun. 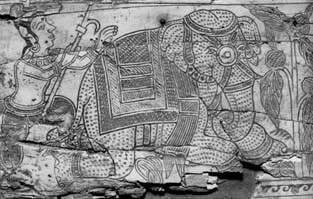 This piece is also from the Kushan era. This is a bronze bust of the goddess Athena, measuring 9 cm in height. This was used as a weight which was attached by a chain to a steelyard, or balance. This painted clay head is 10.5 cm tall, and is representative of a Tajik or Hazara shepherd from either Ghorband or Bamiyan valley. This bronze bowl is engraved with tear drops. The diameter is 17.5 cm. This painted clay pot from Mundigak, is 12.2 cm tall. It is believed to be from the Indus culture. This is a man on a horse from Nuristan. The figure is made out of wood. 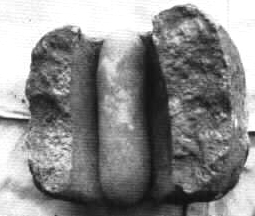 This is typical of the material used for most Nuristani artifacts. Its height is 217 cm. The following are ancient artifacts from Aq Kapruk. They trace back to about 10,000 BCE. 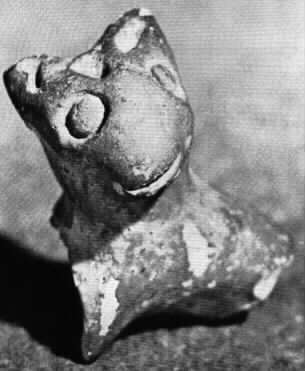 This is a small animal figurine that dates back to the early iron age.